I have been a photographic hobbyist for many years, so when I needed slides of my pots, I was determined to learn to shoot my own. I made a lot of mistakes along the way and my early slides were pretty poor compared to those of a professional. I also found that the various books and articles on the subject leave a lot unsaid or poorly said. As I have gradually improved my capability, I have learned that shooting high-quality photographs is not that difficult! If you have just a little photographic background, you can be taking professional-quality slides in no time. I made the photos which appear in this article using equipment and techniques that will be described here. To replicate this sort of quality, all you need is a modest amount of the right photographic equipment and some specific instructions. You can set yourself up to make excellent slides for approximately $500-about what it costs to have ten pots shot professionally. 1. A good, manual, 35 mm single-lens reflex (SLR) camera body. 2. A lens-preferably a macro lens, but other types will suffice. 7. A table on which to work. Let's start with the camera body. The ideal camera for this type of work is a basic, manual 35 mm SLR camera. There are any number of good brands; however, unless you already own such a camera, wait to decide on the brand until you buy a lens, as the camera and the lens must be made for each other. SLR is a necessity. Point-and-shoot or rangefinder cameras will not give you satisfactory results because you can't see exactly what you are putting on the film. With an SLR, you see in the viewfinder exactly what you are photographing. By a basic, manual 35 mm I mean: manual focus, not automatic; no built-in flash; and manual exposure control. If you already own an SLR camera that has automatic features, it can be used as long as these features can be turned off. One feature you do need is electronic flash synchronization ("X" synchronization). Most SLR cameras made in the last 40 years have it. What do I use? I use a Konica Autoreflex T3 (vintage 1970) that I bought used for $110. That brings me to the best source for a camera of this type: buy it used from your local camera store or from one of the regional photographic equipment shows that are held on weekends near big cities. Another excellent source for used photographic equipment is Shutterbug magazine. It is published monthly and is available at larger news stands. This basic, manual 35mm SLR camera most useful for our type of photography is the type of camera that people bought back in the 1960s and is now being traded in for fancier models. Most camera stores sell used cameras they accept in trade; you can find some real bargains by shopping their used camera counter. Another source is your friend or family member's closet. There are a lot of cameras of this type sitting unused. If you do buy used, the price should be about $100 without a lens. Try to get a 30-day return option in case the camera doesn't function correctly. This type of camera is, however, very reliable. There isn't very much to break. You should buy your lens at the same time or before you buy your camera body, as the two have to be made for each other. The ideal lens is a "macro" lens. Macro lenses can be focused from a few inches to infinity. Normal lenses focus from about 2-1/2 or 3 feet to infinity. When you are taking pictures of, say, a teapot, your lens (if it has a normal focal length of about 50 mm) needs to be about 15"-18" from the teapot in order to fill the frame of the slide. Macro lenses do this job superbly. Unfortunately, macro lenses are expensive and are only occasionally available on the used market. I was able to find a used Konica macro lens for $135, but a new one would have cost about $300. While Porter's lists a Vivitar macro lens for $150, I would look hard for a used one in good condition. Focal length and "f-stop" of the lens are not critical. Focal lengths in the range of 40-100 mm are fine if you can focus closely enough to fill the frame with the smallest pots you will want to photograph. You will normally only use the higher f-stops (like f11 or f16) in order to get good depth of field. Therefore, you don't need to pay extra for a lens that will open up to f1.4 or even f2.8; f3.5 or f4.5 is fine. If you can't find or afford a macro lens, a backup is a standard lens with a close-up lens attachment. A standard lens can normally be used for pots that are 12"-15" in major dimension. For shooting smaller pots, you can buy a series of close-up lenses of various strengths for $30-$50. You will not, however, get as good a depth of field with a close-up lens and you may be disappointed with the results. Just a word about the brand of lens (and the matching camera body). Most professionals have invested a lot of money in the top brands of equipment. This is one area we can't match and still remain within the $500 goal. We can come close by buying good used equipment and by buying only the features we need. I think it is fair to say that the differences between mid- and top- quality equipment are most pronounced when you stretch that equipment to its limits, i.e. using the lens wide open or operating at the fastest shutter speeds. I have specifically selected equipment that will not require operation at the limits, but will be in the mid-range of the equipment's capability. Under these conditions, there should be very little difference in the results produced by, say, the Konica camera which I use and the Nikon which a professional might use. Let's budget $125 for a camera body and $150 for a used macro lens and move on to the other equipment we need. I use a graduated Varitone background I bought from Porter's. They have one that is 42" wide by 62" long for $50. There are several color options although I think white-to-black is the most versatile. If you prefer a solid color background, they also have those. With proper care your background will last for years, so invest in a good one. To decide whether you want a graduated or a solid color background, look at lots of photos of pots and decide which you think will show your pots off to their best advantage. Plan on spending $50-$100 for a tripod. You can buy them for less, but you will regret it. The better ones adjust more easily and are sturdier. You will be adjusting it a lot. Again, buy a used one if you can find one. The weekend photographic equipment shows are great places to look. You can spend close to $300 for a full-featured, name brand tripod; however, this is more than is needed for our purposes. You will need a single studio electronic flash unit which you will mount in the soft box I'll describe later. Although you can use a photo flood light, I have elected to go with electronic flash. I think it is simpler and easier. The simplest kind of studio electronic flash screws into a standard AC light socket. I bought a Deluxe Slave/Master AC Flash S-45M from Porter's for $36. It includes the cord to plug it into your camera. If you can afford a little more, buy one with a modeling light like the S-100M unit sold by Porter's. In any case, you need a unit with about 45 to 200 watt-seconds of power or one that has a guide number for ISO 100 film of 90-150. A flash with higher power will allow you to use slower speed film for finer grain, as described in part two of this article. In general, my 45 watt-second flash works nicely with ISO 200 film, while a 200 watt-second flash would allow use of either ISO 25 or 64 film. I added a socket with a swivel bracket for easy adjustment and a light stand for another $70; however, you can improvise these things if you can do minor carpentry work and your significant other will let you hang things from your ceiling (again, see the second part of this article in the next issue of CT). Overall, you shouldn't spend more than $150 for your electronic flash needs and you can do it for less than $50 with some improvisation. You will not find this kind of equipment in your local camera store. Buy it from one of the sources previously mentioned. Soft boxes are used to soften and spread the light and to help assure elimination or minimization of hot spots on your photographs. They can be purchased for $60-$100; however, one that will serve our needs can be made from foam core board and duct tape for less than $15. Get a piece of foam core board that is 30"x 40" and cut four trapezoids that measure 20" on one base, 6" on the other base, and 15" tall. Tape them together with duct tape to form a truncated pyramid. The bottom of this pyramid needs to be covered with white translucent plastic. I use plastic that is sold in quilting stores for cutting quilting stencils; however, there are other sources. The important thing is that it is white-not cream or yellow-or the color balance on your photo-graphs will be significantly affected. Porter's also sells a material called Trans-Lum which will work; however, the smallest roll they sell is 54" x 72" and costs $20. Tape the translucent plastic to the bottom of your pyramid and you are almost done. The only thing remaining is to mount your electronic flash in the soft box so the flash head is pointing toward the translucent plastic. My suggestion is to improvise with duct tape and small strips of wood if necessary. I would bet most potters are creative enough to acquire this equipment for less than $400 with some help from a friend or family member's closet and a little time spent at a used photographic equipment show. Before you buy even this modest amount of equipment, borrow as much of it as you can and do some testing to see if you can get results that will satisfy you. You can also experiment by improvising before you buy. For example, if you have an electronic flash that is used on your camera's hot shoe, buy an extension cord and mount it in your soft box instead of buying a studio flash. If it works, fine. If you're not happy with the results, then buy a studio flash. In Part 1 of of this article I described the equipment needed to take high-quality slides of pots and made the case that the equipment could be procured for about $500. Figures on this web page are of my pots photographed with the equipment described in Part 1 and the techniques described below. Let's get that equipment set up and use it! The setup is most easily described by referring to the figure here. Put a sturdy work table having a top surface of at least 2 feet x 3 feet up against a wall. Mount your background so it forms an arc from the wall to the front of the table with enough of the background resting horizontally on the table so your pots have a flat spot on which to sit. If you are using a graduated background, pay attention to how high on the wall you mount the background with respect to the height of your pots. This will determine how much graduation actually shows in your photographs. The soft box, with electronic flash inside, is mounted 3-4 feet above your pot; a foot or so to the left or right of the pot; and, front to back, in between the camera and the pot. Hang the soft box from the ceiling with picture wire or buy a $25 light stand from Porter's and hang it from that. Aim the soft box directly at the pot. 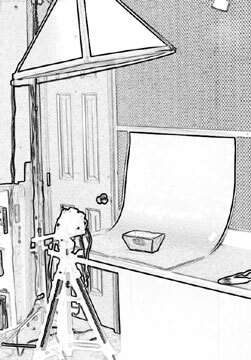 You may want to experiment with the soft box location after you have shot the first few rolls of film, so try to hang it in a way that it can be moved. Put the camera on the tripod, attach a synch cord from the "X" plug on your camera to the flash, plug in the flash unit and you are ready to shoot. Before shooting, though, you have to decide on film. I would make a couple points. After your initial experimental phase is over, pick one slide film and one print film and stick with them for the most consistent results. Don't be tempted by what is on sale when you happen to buy your film. While nearly all films are good, their color balance differs brand to brand and type to type within a brand. The speed of your film is an important factor. The finest grain slides or prints are obtained with the slowest speed film. For projected slides or photos up to 4" x 6" you probably won't see the difference for film speeds between ISO 25 and 400. However, if you want to make 8" x 10" or larger prints or want to use your photographs for high-quality printed brochures, use film speeds no higher than ISO 100. For your first roll of film I recommend you buy a 24- exposure roll of slide film having a speed of ISO 100 or 200. This will give good, fine grain and yet still be fast enough to allow you to use f-stops between f8 and f16 for good depth of field. While Kodachrome® is the best known brand, it is also the most difficult to get processed. It has to be sent to a Kodak licensed lab and processing time is normally about 5-10 days. If you will occasionally want film processed on a tight schedule, use a film requiring E-6 processing. E-6 is normally available locally. I personally use Ektachrome® Elite II 200. For color prints I use Kodak Gold 200. Before you put film in your camera, make sure the camera and the electronic flash are working together properly. Wind the camera, press the shutter and make sure the flash goes off. Learn how long it takes the flash to recharge. I always wait until the ready light on the flash comes on fully and then a few seconds more. Having consistent exposures requires a flash that is fully charged each time it is set off. Check the shutter speed on the camera to make sure it is set at the proper speed for synchronization with electronic flash. That is usually 1/60th or 1/125th of a second, and that speed is normally in a different (red) color on the shutter speed dial. Make sure any built-in flash is turned off. Now you're ready to load your film and shoot. With the first roll of film, focus on one pot and try to accomplish two things: learn the correct exposure for your specific situation and begin learning about composition. First and most important is to take a series of pictures at every numbered f-stop on your camera starting with the smallest number and progressing to the largest. Keep a record of your settings! Having good records will save you a lot of time and money later. After taking your f-stop series, set your lens to f8 or f11 and do some initial work on composition. The exposure may not be perfect, but you will still begin learning. Try some different angles and different camera elevations. You will find big differences in the way the resulting slide looks with seemingly very small changes. 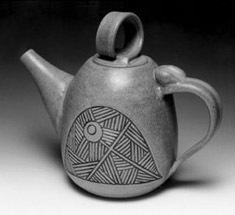 This is particularly true on non-symmetrical pots like pitchers or teapots. This is one thing I can't teach from an article. You need to learn yourself what camera angles (both horizontally and vertically) work best for your pots. Always nearly fill the frame of the viewfinder with your pot and always make sure the front surface of the pot is in focus before you release the shutter. You will be adjusting the camera position a lot and this is the reason I recommended buying a good tripod in the first part of this article. If you still have a little film left after doing the above, find a pot of a different shape and try a couple compositions with it. A 24-exposure roll of slide film with processing will cost $12-15. You should plan on the first 2-4 rolls being consumed with experiments. Get the first roll processed and evaluate it before you take the second roll. The biggest problem you may face is if none of the exposures are in an acceptable range. If they are all overexposed (too light) you will need to use slower film or cut back on the amount of light. Of course, if they are underexposed, the reverse is required. Color slide films are available from ISO 25 to about 1600. Every doubling of ISO number decreases the amount of light required by 50%. Every decrease in f-stop (e.g. going from f11 to f8 or from f16 to f11) also decreases the light requirement by 50%. Adjusting the amount of light is most easily accomplished by moving your soft box closer to or further away from the pot you are photographing. You might also put a double layer of translucent plastic on the bottom of your soft box to lessen the light or find a plastic that transmits more light to increase it. In addition, some of the more expensive electronic flash units can be adjusted for more or less light. The equipment I specified in the first part of this article gives me excellent exposures with ISO 200 film at f11. The odds are pretty good that you will get similar results if you set up the same way I have. On the second roll of film you should be able to narrow your testing of different exposures down to two or three unless you were completely out of range as described in the preceding paragraph. Use the second roll to concentrate on composition with four or five different shapes of pots. You will, more than likely, find that the slides of several of the pots from your first roll of film look terrible. Would a higher angle help? Try turning the pot a few degrees to the left or right. You will learn that any defect of any size on a pot shows up as a glaring defect on a slide. It will take some experience before you get your eye calibrated to really see what a slide will look like by viewing a pot through a camera viewfinder. Experiment and keep accurate records! After your third or fourth roll, though, you should be ready for a real photo shoot of your pots. By then you should know what exposure to use and you should have a good idea how to set up each type of pot that you want to photograph. Finding a reliable processor can also be a challenge. As with film selection, though, once you find a good one, you should stick with it. While each processor theoretically uses the same chemistry to develop your slides, their quality control procedures will vary considerably. Some will use their chemicals too long. Some will not maintain good temperature control or simply will run their process a degree or two warmer. Some will do a sloppy job of mounting your slides. While I am on the subject of mounting, make up your mind early on whether you want cardboard or plastic mounts and stick with that decision also. Most processors can do either, although they nearly always have one they prefer and may not do a good job on the other. Nothing looks less professional than sending a set of slides to a gallery that are all mounted differently. Always specify to your processor which you want. I am still struggling with the question of a processor myself. It is essentially a balance between convenience and consistency or quality. Price is usually not different enough to have any relevance on the decision. What I am moving toward is shooting my slides enough ahead of time to be able to use a processor who has 7-10 days turnaround via the mail. I simply have not been able to find a local processor with fast turnaround who gives me consistent, high quality work. I hope you can. Once you master the basics of making quality slides, you can easily extend your knowledge and capability. For example, when you photograph a bowl and the underside is lost in shadow you will find that you can direct more of the light from your electronic flash to the underside of the bowl with a well-placed reflective surface that is held out of view of the camera lens. You will find yourself making invisible brackets so you can stand a plate on edge to be shot. You may also want to go back and experiment with the position of your soft box to get a larger shadow or one positioned more to the rear of your pot. Like the craft of pottery, the craft of photography offers the opportunity to get better and better forever. What I have described in this and the preceding article is, admittedly, a lot work and not a little expense. Should you do it yourself or should you use a professional photographer? I think that depends on your needs and interests. If you are a production potter whose work evolves slowly and you only need a set of 5 slides for show applications, I would definitely advise having a professional shoot your pots every year or two. If you would much rather be making pots than shooting pots, you should also depend on a professional photographer. On the other hand, if you are a studio potter who makes expensive, one-of-a-kind or few-of-a-kind pots and you want a photographic record of each, you should probably learn to take your own. In my own case, my work is rapidly evolving and I hope it will continue to do so for some time to come. I would need to have work shot three to four times a year for slides that are representative of what I am doing at any given point in time. 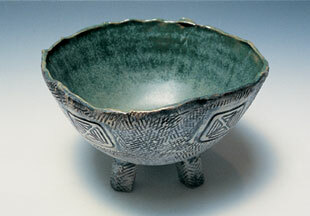 I also like the idea of having a good photographic record of my development as a potter. Another advantage to me is that I never have to have slide duplicates made with all the worry about good color on the duplicates. I simply take several shots of each pot and that usually gives me enough originals to meet my needs. Doing that is actually less expensive than having duplicates made and is, of course, a higher quality way to go. Copyright ©1998, 2008 Clay Times Inc. All rights reserved.